When I was younger, I went to Victoria Concert and Theatre Hall a lot because my church service was held there, but I hadn’t had the chance to take a look after the renovations started in 2010. 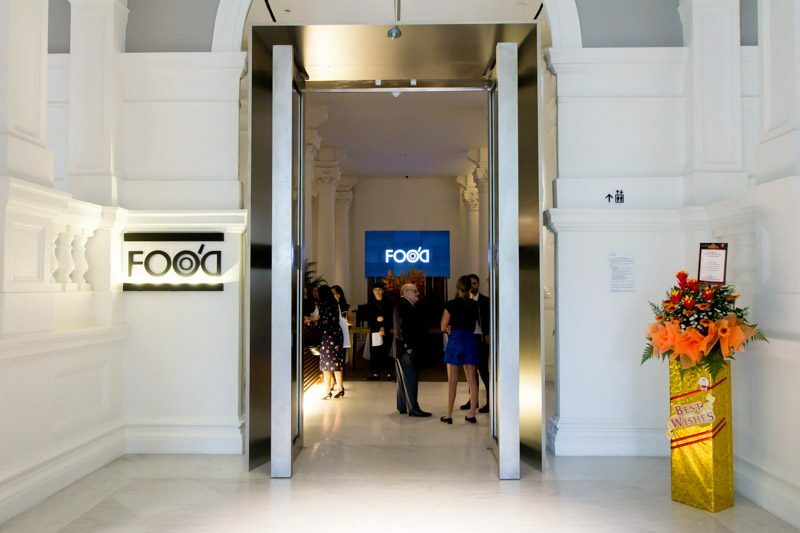 So, when I heard that FOO’D by Davide Oldani was opening in Victoria Concert Hall after renovations, I was pretty stoked to be able to take a look at both the new restaurant and building. 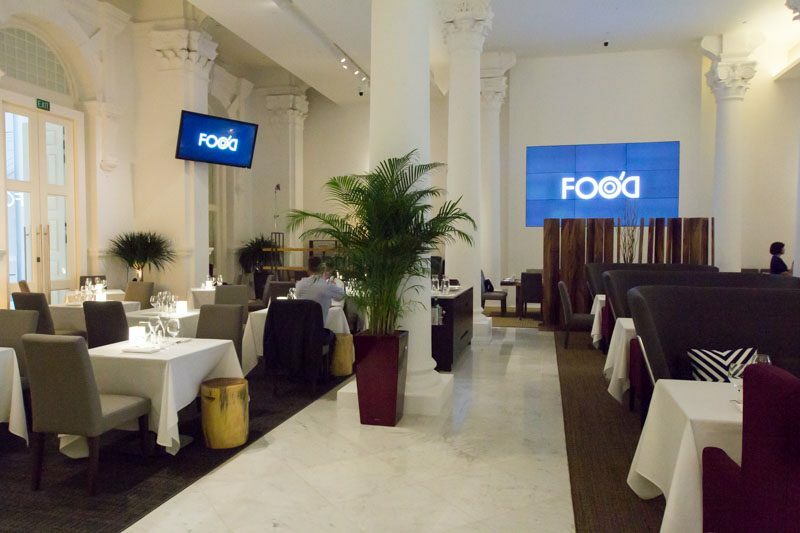 I liked the interior of FOO’D, with its clean white walls and columns; but the LCD screens placed on the sides and in the centre of the room was odd, and made me feel as if I was there for a wedding banquet and photo montages would start playing. Dinner was a five course set affair ($138++), starting off with chef Oldani’s specialty, Caramelized Onions with 20 months Aged Grana Padano Served Hot And Cold. 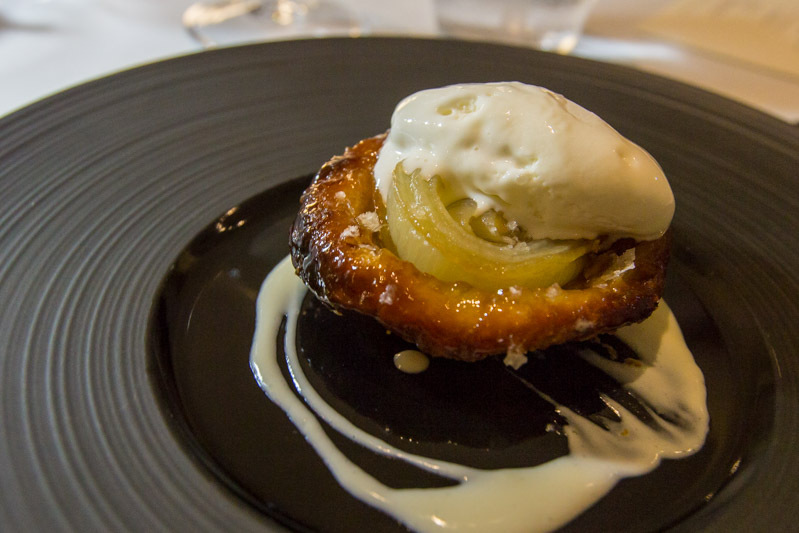 This was probably the standout dish for me that night, with the softness of the onions and Grana Padano ice cream in contrast against the flaky and crispy pastry — the ice cream and cream were a little salty when taken individually, but was offset nicely when combined with the sweetness of onions and pastry. The Pea and Lemongrass Soup with Poached Egg and Almonds was light and refreshing. 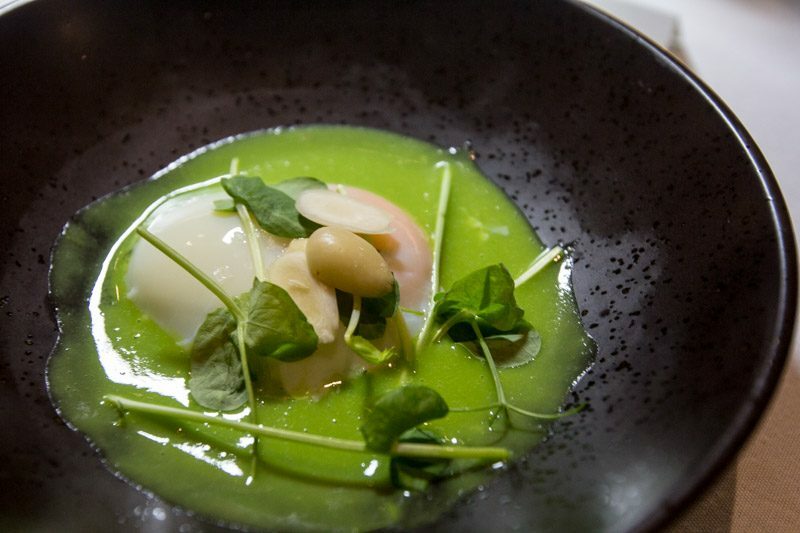 The egg was poached nicely and when broken apart, gave the soup a silky texture that mellowed out the slightly overwhelming taste of lemongrass. The almonds also provided a nice bit of bite amidst all the liquids. Some other guests at my table weren’t as lucky, however, with slightly over poached eggs that weren’t runny like mine. Consistency is something that FOO’D might need to look into in the future. 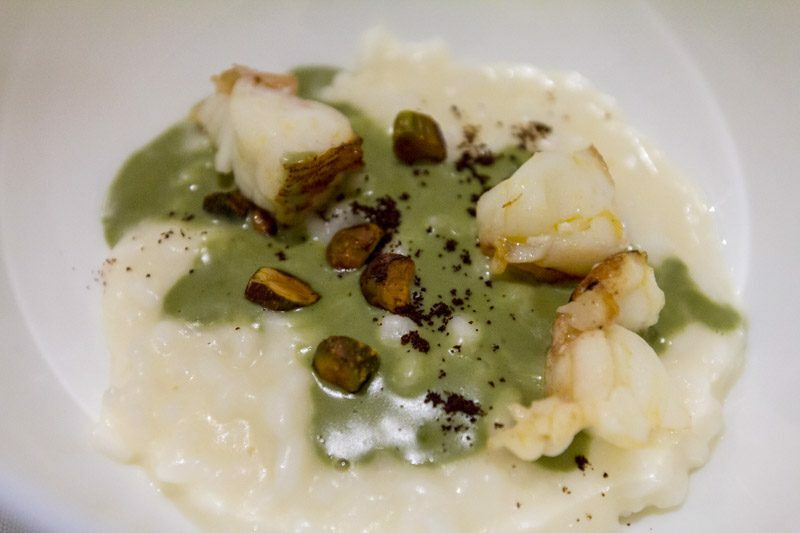 The Risotto With Pistacchio di Bronte and Crayfish sounded extremely interesting, made with rice that has been aged for a year and Bronte pistachios, with coffee grinds and crayfish. The taste of the dish lives up to the hype as well, but I was unconvinced with risotto’s texture. Using aged rice results in a risotto that is firmer than al dente than I would have preferred; the usual Singaporean palate is more used to softer foods, and mine is no exception. 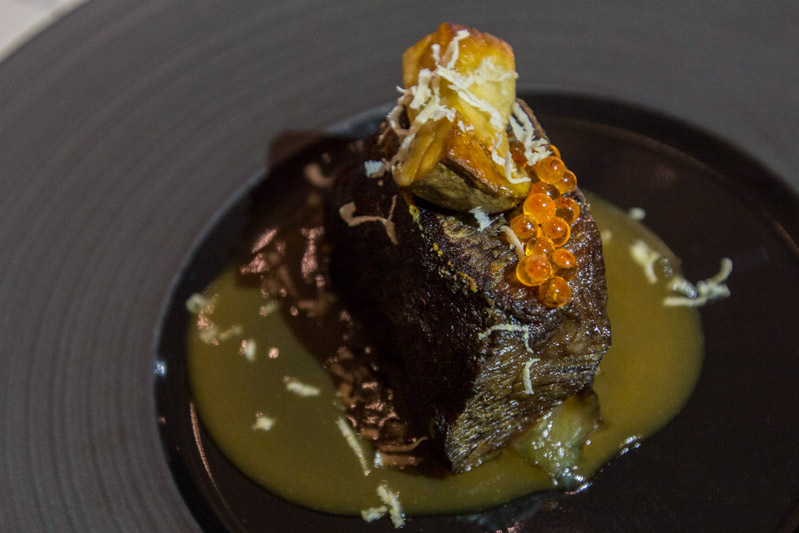 The texture was certainly interesting, however, an open mind is needed when trying this dish. The crayfish was perfectly done, with the coffee grinds producing an understated coffee aroma and a hint of bitterness to the dish. The Beef Cheek with Salmon Pearls and Horseradish was another dish that I liked. The meat was tender and didn’t need much assistance from my knife to fall apart, while the little salmon roe gave the dish a nice burst of saltiness. The horseradish shavings added a little spicy kick as well, but I wish that there was a little more sauce on the plate because the beef was slightly dry. Overall, I enjoyed the deep flavour of this dish, with the taste of the beef shining through. 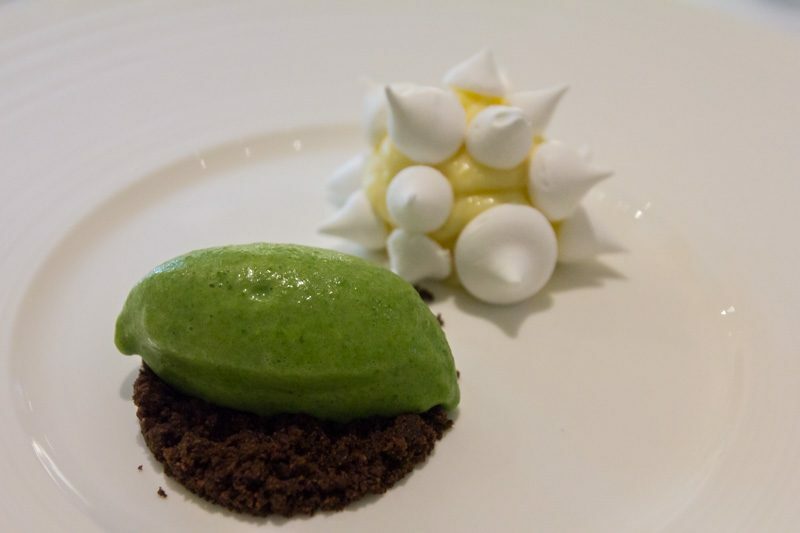 Nothing showcases chef Oldani’s innovativeness better than this dessert, Lemon Curd with Meringue and Lettuce Ice Cream on a bed of Cocoa Crumble; the lettuce ice cream was airy, and not traditionally smooth like other ice creams. When I had my first spoon, I thought that it tasted quite like matcha, ending off with a light note of something akin to raw vegetables, or one of those healthy veggie smoothies. Coupled with the cocoa crumble, it tasted quite similar to matcha chocolate. I enjoyed the lemon curd, it was quite sour and held its form well, and it balanced out nicely with the sweet meringues. The lemon curd and meringues paired well together, as with the lettuce ice cream and cocoa crumble; but if you put them all together, it feels a little disconnected. As separate parts though, I thought they were excellent. If you’re looking for a dinner that will impress, look no further. The food here at FOO’D by Davide Oldani is certainly an eye-opener, and I’m definitely amazed by the way different ingredients came together to form dishes that I never would have expected.